Our Business Coaching Service concentrates on “you” as a person. 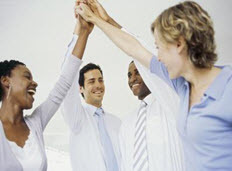 It offers you professional and personal development to be successful in your business. We help you to focus on the “big picture” of what it is you want to create for yourself and your business and provide strategies that will keep you motivated. Together, we help you move forward. As your coach, we will encourage you, support you, applaud you, and empathize with you and yes, challenge you. We help you to discover honest insights into why things aren’t working; calling you on the “self-imposed obstacles” that you sometimes put in your way. And sometimes, we are just someone you can talk to, who will unconditionally support you without judging. We help you tap the “wisdom within.” What can we do for you as your business coach? Get your business on track by getting you past ruts, blockages and challenges. Help you to recognize what works for you and your business. Developing plans and processes to measuring performance. Facilitate your perspective to think differently, positively, and effectively. Work on what is most significant. Be accountable and staying on track. Our Mentoring Service can help with the effective transfer of knowledge and experience, grow talent faster and foster personal growth and development. In today’s constantly changing business environment, having a mentor is the key to success and to sustainability to give a company or organization a competitive advantage. As the workforce ages and retirement is happening seemingly at a rapid pace, companies are recognizing that there is and will be a drain on institutional knowledge and a huge vacuum to fill, if they don’t act now. Improved personal and professional performance. Enhanced employee skills sets and confidence. Gaining a sense of accomplishments. Learning new perspectives from others. Develop technical and interpersonal skills. Enhance personal and professional growth. Customize a mentoring program for your business or organization.